Even before Egypt’s National Elections Authority (NEA) announced a timeline for the presidential election, President Abdel-Fattah El Sisi—and a government that is increasingly aligned behind him—had pulled every string to ensure the longevity of his rule. Despite concerns, criticism, and even outright rejection of the “election” from around the world, polls opened in Egypt on March 26. But the stage had long been set, and the announcement of vote tallies merely marked the proof: Sisi will rule for another four years at minimum, as calls from parliament to amend the constitution and lengthen term limits have already begun, and international governments and institutions have already accepted this status quo as requisite for stability. As TIMEP noted in its report Raising the Stakes: Implications of a Second Sisi Term, Egypt’s future under Sisi bodes ill for the ongoing deterioration of rule of law, rights and freedoms, and, ultimately, stability. 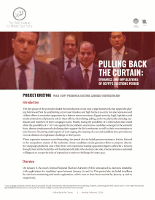 This final brief in the series Pulling Back the Curtain: Dynamics and Implications of Egypt’s Elections Period highlights developments and dynamics during and after the voting period, with a particular focus on domestic and international reactions in the aftermath of the official announcement of victory. While there have been some mixed messages, Western and regional powers have largely demonstrated acquiescence to, if not outright embrace of, Sisi’s manner of securing and preserving power. Voting took place in two different phases: Egyptian embassies worldwide opened their doors March 16–18 for expatriates, and the NEA held domestic voting March 26–28 (for more, see our fact sheet on laws and procedures). The NEA announced on April 2 that voter turnout was 41 percent of registered citizens. As expected, Sisi secured another term, with 97.1 percent of all valid ballots. Candidate Moussa Mustafa Moussa garnered 2.9 percent of valid ballots, falling behind the 7.3 percent of all ballots that were deemed invalid. Moussa, a longstanding supporter of Sisi before being pressured into the campaign at the eleventh hour, praised Sisi for his victory and called it a victory for the state and all Egyptians. While critical of Sisi’s regime and the election prior to the voting period, the Civil Democratic Movement, a boycott initiative comprising former politicians, did not make any public statements around voting time. As in previous phases, the U.S. sent mixed messages, with President Donald Trump and the State Department holding different positions about domestic concerns within Egypt. Despite concerns from international civil society on the symbolism of endorsing an election that was neither free nor fair, Trump nonetheless congratulated Sisi in a phone call. A press statement and remarks from State Department spokeswoman Heather Nauert did not extend congratulations; Nauert further acknowledged the “constraints on freedoms of expression and association in the run-up to the elections.” While not directly related to the election, further concerns about human rights abuses and counter-terror tactics under Sisi were raised when Senator Patrick Leahy (D-VT) withheld $105 million in fiscal year 2017 foreign military financing in early May. Officials from Ethiopia and Sudan congratulated Sisi on his reelection, yet their offers of support did not lead to tangible progress in the stalled Grand Ethiopian Renaissance Dam (GERD) negotiations. Sudanese President Omar al-Bashir and recently appointed Ethiopian Prime Minister Abiy Ahmed expressed their congratulations to Sisi in separate conversations following his reelection. Both leaders also asserted their desire to maintain bilateral relations with Egypt in order to reach an amenable solution to the GERD crisis, which has developed into a source of conflict based on each country claiming differing impacts of the dam on the Nile River and water reserves. Yet these conversations did not yield any progress regarding the dam, as representatives from the three countries have gathered for two separate summits to debate the issue without achieving a resolution. Other heads of state and leaders expressed their congratulations to Sisi, echoing a consistent message of stable diplomatic relations under a second term for the Egyptian president. Sheikh Muhammad bin Zayed al-Nahyan of Abu Dhabi stressed the special relations between the two countries while congratulating Sisi on his electoral victory. Yemeni President Abd-Rabo Mansour Hadi expressed his appreciation of the “supportive role that Egypt has been playing for the stability of Yemen.” Other Arab heads of state, including King Abdullah of Jordan and President Omar al-Bashir of Sudan, expressed similar sentiments. Chinese President Xi Jinping issued a statement expressing his hope that the Egyptian people will make more important achievements in exploring Egypt’s path to development under Sisi’s leadership. Russian President Vladimir Putin spoke with Sisi on the phone, saying that “the election’s outcome has proved your great authority among your fellow citizens and their wide support for your policy aimed at resolving pressing social and economic issues.” Kim Jong-un of North Korea also congratulated Sisi on his reelection, adding that he hoped the two nations will maintain their strong diplomatic ties. Several monitoring organizations connected to the NEA praised the electoral process. Prior to announcing the election results, Ibrahim emphasized that the NEA had monitored the elections “within a legal, professional, and moral framework dominated by independence, impartiality, integrity, transparency, professionalism, and the rule of law.” The Community of Sahel Saharan States and the Common Market for Eastern and Southern Africa, both of which monitored the elections, issued a joint statement upholding the peaceful and transparent nature of the electoral process. Similar statements were put forward by both the African Union Election Observation Mission and the Arab Parliament, with the latter going as far as claiming that this presidential election was the most transparent in Egypt’s history. The government employed myriad ways of convincing voters to head to the ballot box. The Wall Street Journal detailed how regional governors promised the installation of infrastructure for essential utilities if voter turnout was high. The New York Times reported promises of subsidy boxes that included basic goods such as oil and rice, and offers from pro-government charities for free bus rides to polling stations. The same report revealed that some individuals in Marsa Matrouh were apparently extended invitations to go on pilgrimage to Mecca in exchange for voting. The General Union for Cooperative Groups set up a fund of 4 million Egyptian pounds (LE) for the city, village, and polling station with the highest voter turnout. The New York Times also reported that in Assiut and Minya, police officers went door to door urging people to go out and vote. Despite these widespread cases of vote buying, illegal electoral practices, and ballot discrepancies, public officials insisted on the validity of the election, and the NEA failed to conduct any investigation. Lashin Ibrahim, president of the NEA, stressed that ballots were secured that there was no possibility of tampering, and heralded the election as a process that would “establish popular control and balance between the rulers and the ruled.” Voters, however, voiced their complaints over the process of voting, and a special council established to process women’s complaints during the election reported 224 complaints and over 500 investigations. The National Council for Human Rights President Muhammad Faiq also said that the council had received several complaints from disabled individuals concerning the accessibility of polling stations. The Supreme Council for Media Regulation also received multiple complaints from voters on March 27 concerning polling location or issues with individual voter registration on the second day of voting. After serious contention between independent media and the Egyptian state, the government made half-hearted attempts to encourage international and domestic media coverage during this period. The NEA published a list of media regulations for correspondents to adhere to during the domestic election period, including limited access to NEA headquarters, a prohibition on conducting exit polling, and the restriction of journalists’ ability to interview citizens at voting locations about the election. Despite these prohibitive measures, the State Information Service (SIS) permitted correspondents from international media outlets to enter polling locations and discuss the election with voters. Similarly, the SIS and Egyptian Press Syndicate said that they did not receive any complaints from domestic or international correspondents about access to polling stations, with the SIS saying it even contacted reporters to ensure they did not encounter any issues while reporting. Although media institutions appeared to be given a reprieve during the voting period, a backlash against news outlets intensified to arguably the most egregious abuse of press freedoms under Sisi’s tenure. The day following the election, the SIS threatened to summon correspondents from international organizations if they published articles in a manner deemed “unprofessional.” The government followed through, fining the newspaper al-Masry al-Youm LE150,000 and referring the paper’s editor and a journalist for investigation for a story titled “State Mobilized Voters on Last Day of Election.” Similarly, Reuters published a report detailing vote buying in the election (which was redacted amid this pressure, along with the al-Masry al-Youm article). Media outlet Masr al-Arabia was fined LE50,000 for covering the publication of a New York Times article detailing voter bribery. The outlet’s headquarters were raided and Editor-in-Chief Adel Sabry was arrested for what the state claimed involved licensing issues. In the week following the NEA’s announcement of Sisi’s victory, five other journalists were arrested or reported missing. The full list includes photojournalist Adel Eissa of Mubtada, photojournalist Shorouk Abdel Gawad of al-Shorouk newspaper, photojournalist Belal Wagdi of Masr al-Arabia, Mohamed Ibrahim of the blog Oxygen Egypt, and journalist Hossam Wakil, the former head of al-Dostour newspaper. Egypt Independent published a similar story of monetary awards for areas with high voter turnout surfaced during the election, including one concerning an LE15 million fund reserved for the five villages in Egypt’s New Valley governorate with the highest turnout. The story has since been removed from the publication’s website.